Усталюйце гэтае праграмнае забеспячэнне і выпрабуйце магчымасці, якія яно можа падаць вам. Хоць трэба некаторае чакай, каб абвыкнуць да дадатковых функцый, вы пераканаецеся наколькі стане прасцей працаваць з кампутарам з гэтым пашырэннем. - Стварыце сваё ўласнае аптымізаванае кантэкстнае меню, хаваючы непажаданыя меню, пераладжваючы парадак меню, размяшчаючы падобныя меню ў нядаўна створаную тэчку дрэва меню, змяняючы значок меню на ваш уласны і гэтак далей праз модуль налады. - Вы можаце заўсёды паказваць радкі або слупкі асноўнага кантэкстнага меню , напрыклад, "Адправіць" у меню "Наладзіць" > "Паказаць">..
- Вы можаце паказаць усе даступныя меню, пстрыкнуўшы правай кнопкай мышы з клавішай SHIFT. - Вы можаце стварыць набор праграм, якімі стала карыстаецеся, для адначасовага запуску. Спасибо за Persian выканаў Asom Nookin. Дзякуй за садзейнічанне!!! Спасибо за Slovenian выканаў dr. Vinko Kastelic. Дзякуй за садзейнічанне!!! 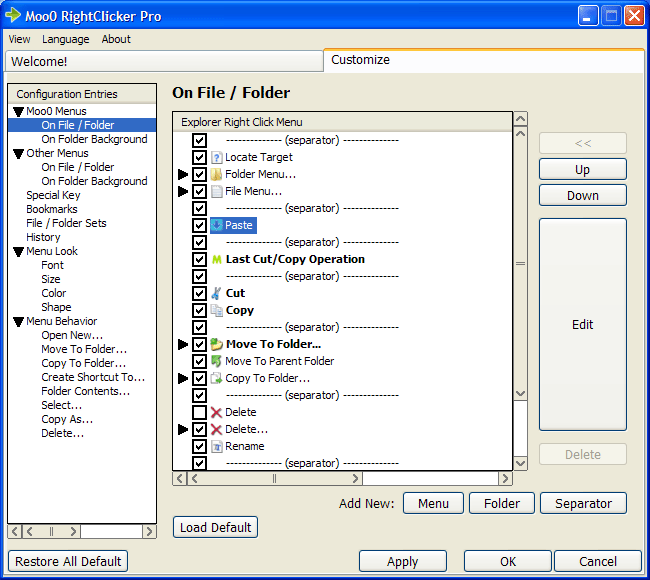 FAQ: Windows 7) Shortcut files can't be selected by "Select..." menu. 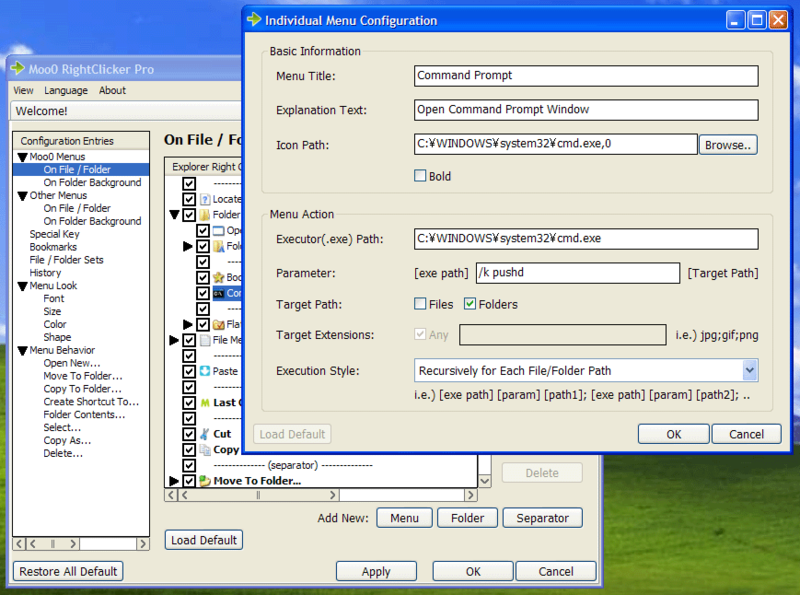 There is a fatal bug in Windows 7 explorer that it crashes whenever it's requested to select shortcut files programmatically. We can't find any other way but to wait for their updates. 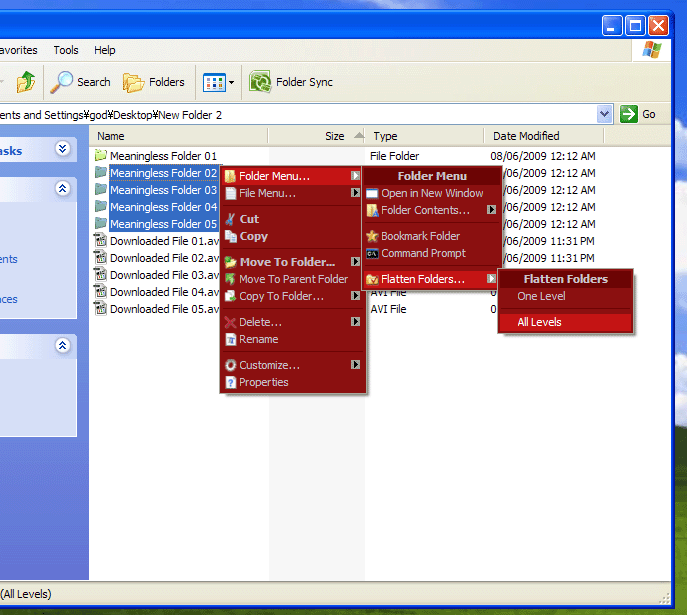 Windows 7) Moo0 menu doesn't always appear under Library folders. This program is currently functional only under their subfolders. We'll try to support it better soon. It seems to be a sort of bugs on Windows itself. It almost randomly happens when there are many menus registered (and especially when there are static sub-menus which reserve their individual menu IDs). The followings are the solutions we've found so far. 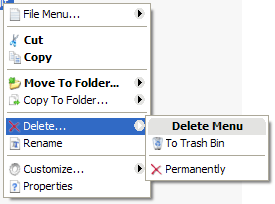 Solution 1) Unregister some of non-Moo0 menus. 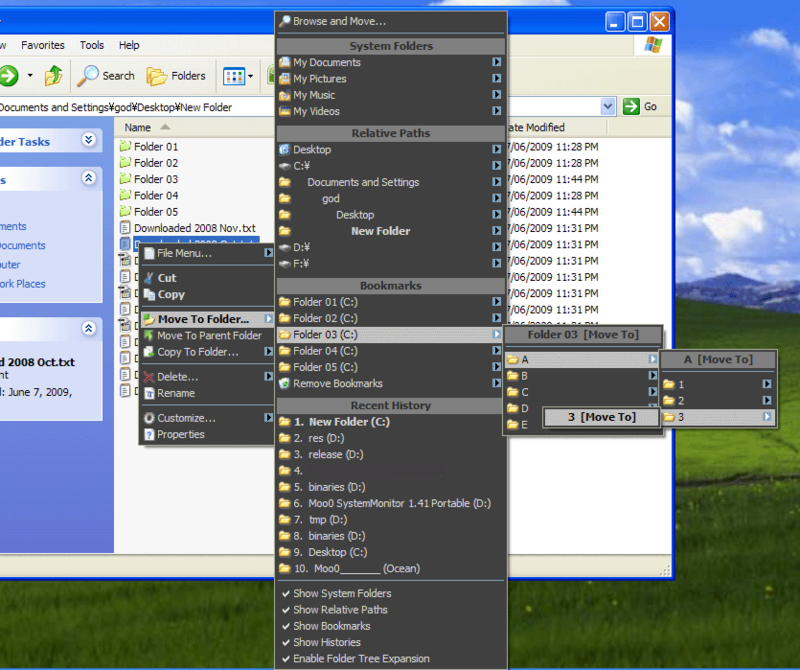 Especially the ones with static sub-menus (statically defined tree style menus which reserve their individual menu IDs). Our sub-menus are all dynamically displayed without reserving the problematic menu IDs, and they don't seem to cause this problem. 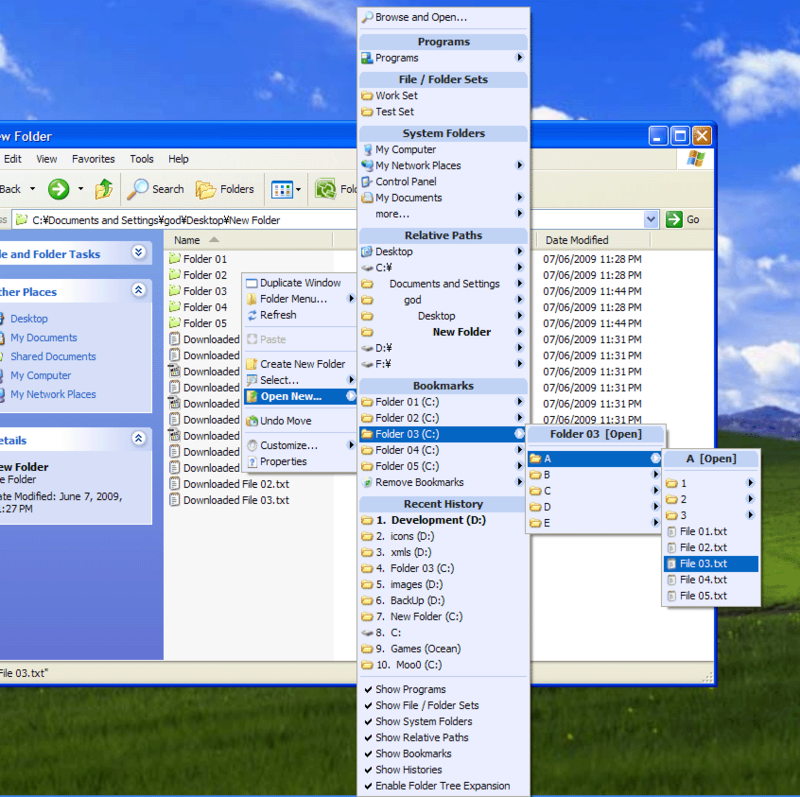 However, adding even one simple top level Moo0 menu (or any other 3rd-party program's menu) can trigger this problem when there are those kinds of 3rd-party sub-menus. Solution 2) Update Windows or uninstall some of update patches. This problem appears / disappears depending on which update patches are installed. 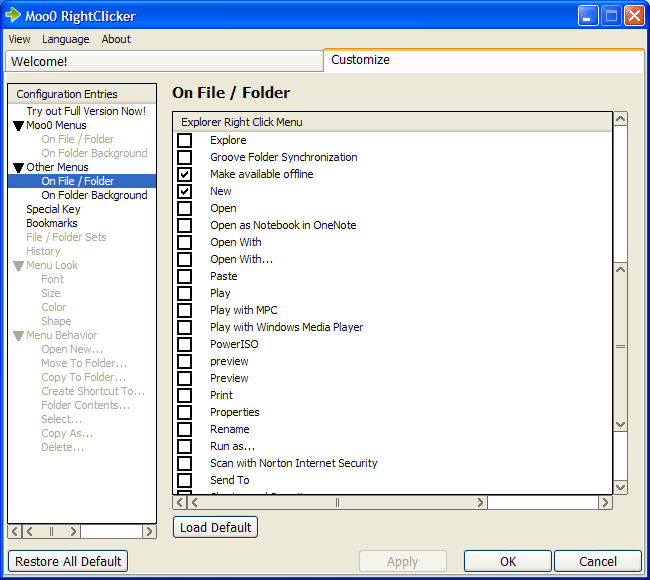 Solution 3) You can always turn on / off our Moo0 menus from the RightClicker main window. Turning it off gives the same effect with the uninstallation, and our program will not affect the right-click menu what-so-ever. 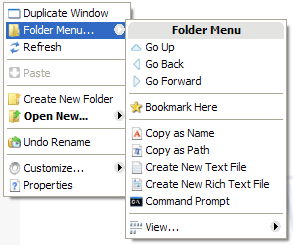 By doing this, 3rd-party menus can regain slightly more room to reserve their menu IDs. We strictly try to follow Microsoft instructions, and also we are very very careful not to cause any of these problems. However, there are also things that we can't control in operating systems. We ask for your understanding. We'll keep investigating this more. (Symptom: Prior to ver. 1.27) Some menus are drawn blank white. This seems to happen due to conflicts with some other programs. 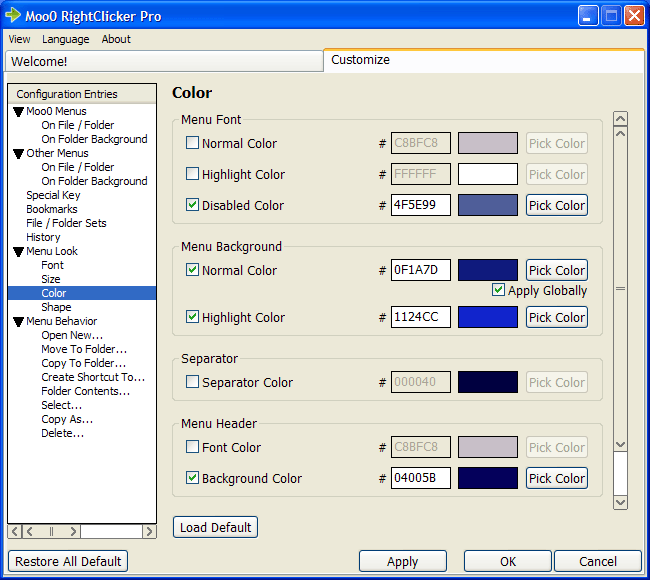 Please tell us the other context menu entires shown when our menus are drawn blank white. We'll see what we can do to resolve the conflict. - (from ver. 1.27): We have implimented some counter measures from this version. (Symptom: Prior to ver. 1.23) Impossible to change back from "Simple Mode". Well, you can, but it's only from the "Customize" menu, which is shown when you right click on folder/desktop background. We will fix this confusing behavior on the next update. We are very sorry for the discomfort that you might have experienced. - (from ver. 1.23): We have altered the behavior from this version. Функцыянальныя магчымасці гэтага праграмнага забеспячэння добра абраныя і проста запускаюцца. Калі вы жадаеце прагледзець усе функцыянальныя магчымасці, выпрабуйце Moo0 RightClicker Pro.